(Newser) – Relations between Syria and Turkey got even more volatile today when Turkish fighter jets forced a Syrian passenger plane to land in Ankara, reports the BBC. 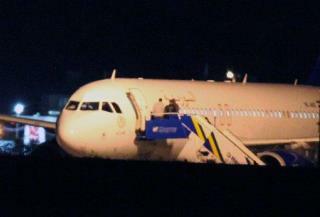 Turkish officials detained the plane and passengers briefly and confiscated suspected military cargo. They wouldn't specify what came off the plane, which was flying in from Moscow. "We are determined to control weapons transfers to a regime that carries out such brutal massacres against civilians," said Turkey's foreign minister. "It is unacceptable that such a transfer is made using our airspace." Tens of Machinegun-Equipped Cars Destroyed, Many Terrorists, Some Not Syrians, Killed The Armed Forces on Wednesday destroyed 3 stolen ambulance vehicles loaded with weapons and ammunition and 2 DShK-Equipped cars near Agyour roundabout in Aleppo city. SANA reporter quoted a source at the province as saying that terrorist Ahmad Abu al-Lail, leader of an armed terrorist group, along with 3 PKC gunmen and 2 RPG users were killed. The army continued the operation of clearing the area of Karm al-Jabal in Aleppo from the terrorists, eliminating large numbers of them. A unit of the Armed Forces targeted a terrorists' gathering in Bab al-Hadid roundabout and destroyed a truck equipped with a mortar and a twin-mounted anti-aircraft machinegun and two Jeeps. The army members also killed and wounded a large number of the terrorists in the area. Terrorist Ahmad Lolek, leader of one of the armed terrorist groups, was identified among the dead. Another unit of the Armed Forces confronted an armed terrorist group attempting to enter the Great Umayyad Mosque, killing and injuring a large number of its members while the rest fled away. An official source in the province dismissed as "baseless and false" the news reported by some instigative channels about the terrorists taking over the Mosque, SANA reporter said. A unit of the armed forces destroyed 9 cars equipped with DShK machineguns and a twin-mounted anti-aircraft machinegun in a qualitative operation against terrorists near Qadi Askar roundabout and Kefah al-Ghaderi School in Aleppo city. The operation resulted in killing scores of terrorists, in addition to destroying 5 stolen ambulances loaded with weapons and ammunition. A leader of an armed terrorist group, nicknamed Abu Issam, and a number of terrorists were killed in a qualitative operation near al-Wahda bakery in Kadi Askar area in Aleppo. The armed forces carried out a qualitative operation that destroyed a Volvo refrigerated truck and several ambulances loaded with weapons and ammunition and terrorists on al-Bab road in Aleppo. Armed forces units targeted terrorist headquarters in Bustan al-Qasser and Souq al-Fustuq areas, eliminating a number of terrorist and injuring others. One of the injured is Ahmad Afesh, the leader of a terrorist group, and his assistance who is nicknamed al-Zabbah (throat-slitter). In al-Marjeh area , terrorist Sleiman Mahmoud al-Hantoush was injured all the members of his terrorist group were killed in an operation by the armed forces. An armed forces unit destroyed two trucks loaded with weapons and eliminated a number of terrorists near Khayyata Mosque in al-Fardous area. Father Imad al-Daher was wounded when two mortar rounds were fired by terrorists at the Greek Catholic Archdiocese in Farhat Square. DShK-equipped Cars Destroyed in Aleppo Countryside On Tuesday, the Armed Forces carried out a qualitative operation against a terrorists' gathering in Andan area in Aleppo countryside. The operation resulted in destroying 9 cars equipped with DShK machineguns and killing a large number of terrorists. Terrorists Abdul-Aziz Oneizi Bin Hamed, of a non-Syrian nationality, Abdullah al-Ahmad al-Dahho and Mahmoud al-Mahmoud al-Dahho were identified among the dead. 12 year-old child Ali Mohammad al-Hammoud was injured when a terrorist group led by Mohammad Ismael al-Beff opened fire on a protest demanding that terrorists leave the village of Assan in Aleppo. An armed forces unit destroyed eleven cars equipped with DShK machineguns along with the terrorists inside them on the road between Tal Refaat and Akhtyarin in Aleppo countryside. The armed forces targeted gathering and bases of terrorists in al-Kamari, al-Khafsa and Deir Haffer, leaving tens of them dead or injured. Armed forces units carried out an operation targeting terrorist bases in al-Atareb area, resulting in the death of tens of terrorist including Khalaf al-Sawat from Saudi Arabia and Mahmoud Talal al-Fahed from Iraq, in addition to Mohammad Barakat from Jabal al-Zawiye, Tamam Mushir al-Masri from Jisr al-Shughour, and Abdullah Mohammad Eid from Daret Azza. Another armed forces unit targeted a terrorist base in Oram al-Sughra, killing a number of terrorists and injuring others. Terrorists Killed, DShK-Equipped Cars Destroyed in Homs A unit of the Armed Forces on Wednesday destroyed 4 DShK-equipped cars and killed scores of terrorists in the town of Burj Qa'ai in al-Houla area, Homs countryside. SANA reporter quoted a source in the province as saying that a number of terrorists were killed and others injured in Burj Qa'ai town and in al-Rastan city. The source added that another unit of the Armed Forces targeted a terrorists' gathering near Bab Hud in Homs city, killing scores of them. The armed forces also carried out an operation in Bab Hud neighborhood in which a 23.5 mm cannon was destroyed and a number of terrorists were killed or injured. An armed forces unit targeted gatherings of terrorists in the towns of Kammam and al-Saloumiye in al-Qseir northern countryside in Homs province, killing and injuring a number of terrorists. Another unit pursued terrorist groups in the areas of al-Zira'a, al-Nizariye and Jusiye in al-Qseir southern countryside, eliminating a large number of terrorists. Terrorist Mohammad Bakkar, leader of a terrorist group, was killed along with his entire group in an operation carried out by the armed forces in al-Qseir countryside. In the town of al-Rastan, an armed forces unit targeted terrorist gatherings, killing and injuring them, while another unit clashed with a terrorist group in al-Khalidye neighborhood, eliminating a number of them and injuring others. Armed Forces Seize Explosive Device Factory, Locally-Made Missilles in Damascus Countryside In Damascus countryside, armed forces discovered a factory for making explosive devices, locally-made rockets hidden underground and various weapons, including U.S.-made sniper rifles in Jisreen Farms in Eastern Ghouta. A military source told SANA reporter that the army killed dozens of terrorists during the operation. The authorities arrested terrorist Omar Kamel al-Shamandi while he was planting an explosive device in al-Suyouf square in Jaramana. Engineering units are working to dismantled the device. Army Kills Scores of Terrorists in Daraa A unit of the Armed Forces on Tuesday evening clashed with an armed terrorist group that tried to attack a law-enforcement post in al-Yadouda town in Daraa countryside, killing and wounding scores of the terrorists. SANA reporter was informed by a source in the province that terrorists Thaer al-Haj Ali, Mohammad Shtara and Mohammad al-Hasheesh were identified among the dead. The source added that another army unit clashed with terrorists in the town of Kafr Shams in the countryside, killing scores of them. The source said that terrorists Mohammad Ibrahim al-Shaabani and Mohammad Mousa al-Dammad were among the dead. In the same context, the authorities confiscated a large amount of weapons, ammo and stolen medical supplies while pursuing terrorists in the towns of al-Karak al-Sharqi and al-Ghariyeh al-Sharqiyeh in Daraa countryside. A source at the province said that the authorities pursued terrorists in the area of Waar al-Masmiyeh in al-Lajat area, eliminating a large number of them and confiscating automatic rifles and handguns they had in the possession. The source added that engineering units dismantled a large number of explosive devices and antitank landmines planted by terrorists at the entrances of al-Karak al-Sharqi and al-Ghariyeh al-Sharqiyeh. Armed Forces Destroy Terrorists' Den near the Farmers Union in Deir Ezzor A unit of the Armed Forces in Deir Ezzor Province on Wednesday destroyed a terrorist's den near the Farmers Union building. Authorities Confiscate Weapons and Explosives in al-Sejen Neighborhood in Lattakia During a raid of a terrorist hideout in al-Sejen neighborhood in Lattakia city, the authorities confiscated weapons and firearms, including 175 kilograms of C4. Confiscated items also include detonators, RPG rounds, remote-controlled circuits for detonating explosives, diving equipment, and gas masks. Authorities Clash with Terrorist Group in Raqqa Countryside The authorities clashed with a terrorist group near the turnpike of the village of Ali Bajlia in Tal Abyad area, Raqqa countryside. The clash resulted in the destruction of 3 pickup trucks equipped with machineguns and the elimination of the terrorists inside them, in addition to confiscating two RPG rounds, ammo and three pump-action shotguns. Its heartwarming to see how former foes can become so close: Just a few years ago The pig-dog Turkey was snarling and foaming over Israel's slapping some of the pig-dogs' pups off the coast of Gaza. Now the pig-dog is running the errand of the warmongering Netanhooyaa from his safe perch atop the inappropriately named Hierosolyma, and such a willing peon of the Dark Knight, peace prize-winning, proxywar specialist, in the as-inappropriately-named White House. Alas, though, how fast friendships can fade, as the pig-dog's alliance with Assad has vaporised so swiftly! When, we ask ourselves, did the pig-dog realise that the Assad was a brutal dictator like his Pa? Methinks it was right around the time that the pig-dog got to smell those goodies emanating out of the pantry of the Dark Knight's temporary living quarters. This is terribly annoying,the plane was filled with passengers and yet turkey decides to act as if it confiscated military cargo. The rebels have no place in syria,they ARE the murderers,2nd to the government,but they are what they are.